My mother has an invasive flower in her lawn. It’s a shame it’s so beautiful because every time we mow the blue carpet of blossoms get cut away. 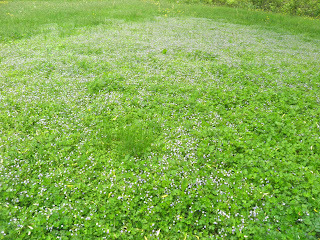 This is part of my mother's lawn. The grass is entirely gone. These flowers define the colour “blue.” The flowers are almost the colour of the sky on a cloudless day. Quite stunning, en masse, and massed they certainly grow. 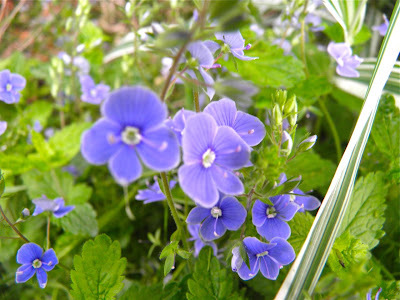 The flower in question is a form of Veronica called Germander Speedwell. 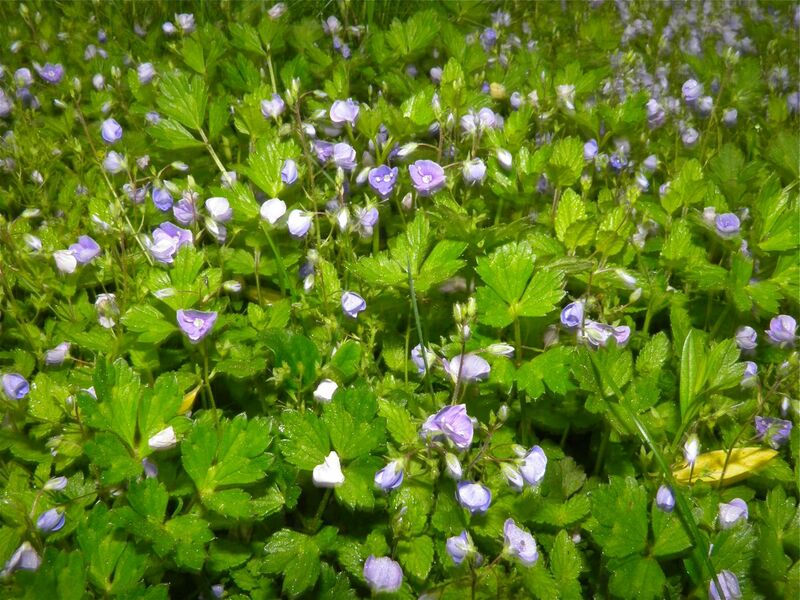 Germander Speedwell is a low growing plant that if given the opportunity will take the place of the grass on your lawns. That fact alone makes it a little less impressive. This plant is not a native to North America. It was an introduction by European settlers, and has settled in quite happily. Germander Speedwell (Veronica chamaedrys) is not to be confused with Common Speedwell (Veronica officinalis) or Common Germander (Teucrium chamaedrys). Although similar in name, the three are all different. Even by the botanical names you can see where confusion could arise. 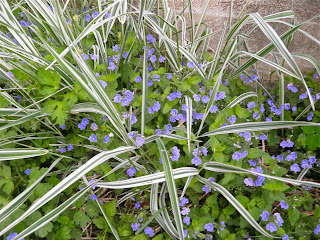 The plants have a short, upright stalk with paired leaves topped with numerous flowers. The blue flowers have a distinct white 'pupil' in the centre, giving it the common name of “bird’s eye.” They open in the morning and close at night, but the flowers only last a day or two, only to be replaced by more. The blossoms wilt very quickly when picked, which has given it the German common name "Männertreu" (men's faithfulness). Interesting. Germander speedwell will tolerate almost any soil from alkaline to slightly acid, heavy clay to dry and sandy. Germander is difficult to control because it has a fibrous root and spreads rapidly. It creeps along the ground, spreading by roots at the stem nodes. It propagates by both by seed and stem fragments. So if you really want to get rid of it expect to do some digging. According to legend its generic name “Veronica” is from the Latin vera (true) and icon (image). According to legend, a woman named Veronica wiped the sweat from Jesus’ face and the blood from his brow as he carried the cross, and an image of Christ appeared in the cloth she used. Germander speedwell’s flowers do resemble a face, with the stamens being the eyes. But how that story is linked to the flower is lost in the mists of medieval Europe, one assumes. This is early morning, before the flowers reopen for the day. Germander speedwell’s leaves are used in the same way as heath speedwell (V. officinalis) to make tea. 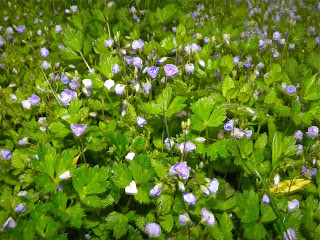 In Sweden the plant is known as tea speedwell. The plant is a blood purifier and can help heal wounds. It is applied externally to skin and is said to be an decent treatment for itch. Internally, an infusion of the leaves once had a reputation for the treatment of coughs, asthma, etc. In ancient herbal medicine, the juice was boiled into a syrup with honey. An infusion of its leaves was used for coughs and a decoction of the whole plant was employed to stimulate the kidneys. It was also used as a blood purifier. When in flower, the entire plant was used for sweats, and its astringent and stimulant properties. Its root was also used as a preventative against fever. It was believed to be a cure-all for many ailments, including smallpox, measles, cancer and kidney problems. 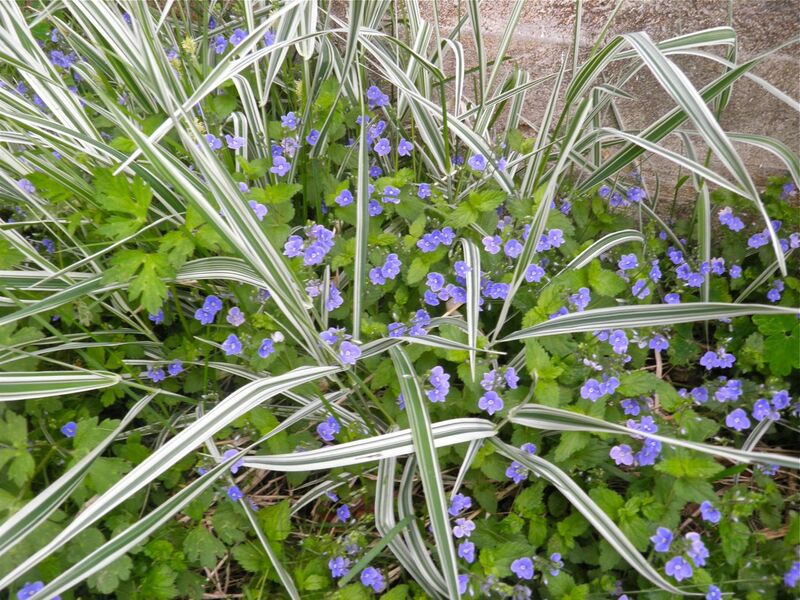 The main problem with this plant is its invasive nature. 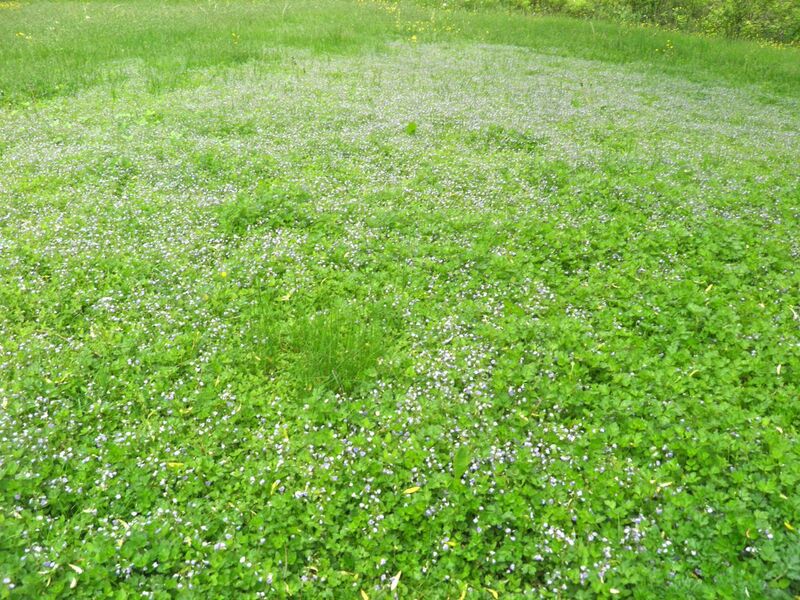 If you do wish to include it in your garden I suggest that you plant it where it can completely take over with no ill will, and let your lawn mower keep it in check.